As marketers, we spend a lot of time designing sleek landing pages, developing email nurture campaigns, writing strong copy, and A/B testing just about everything. But according to Infinite Conversions, most of our efforts are wasted. 75–98% of visitors who abandon our site never return. Talk about a blow to the ego! So how do we engage visitors and capture their valuable data before they jump ship? We figure out what’s killing our conversions and go to battle! Here are a few key ways to thwart web form conversion killers. According to LoginRadius, most users will skip signing up for a new account if it means filling out a registration form and remembering another password. But nearly 80% are okay with signing in via social login options. Use this knowledge, and integrate your forms with social media autofill features. The 2015 Form Conversion Report indicates that adding Social Autofill to a web form can increase conversion rates by as much as 189%. A strong call-to-action (CTA) can keep users from abandoning your form. The top 10 converting buttons analyzed for the 2015 Conversion Report all contained two words or less. The addition of just one word after “submit” was shown to boost conversion rates up to 320%. Pay Attention to Web Page Load Times. If your web page doesn’t load quickly (and I mean quickly), you will lose visitors. A Google/Bing collaborative study on user performance indicates that as little as a two-second delay in page responsiveness reduced user satisfaction by 3.8%, increased lost revenue per user by 4.3%, and reduced clicks by 4.3%. 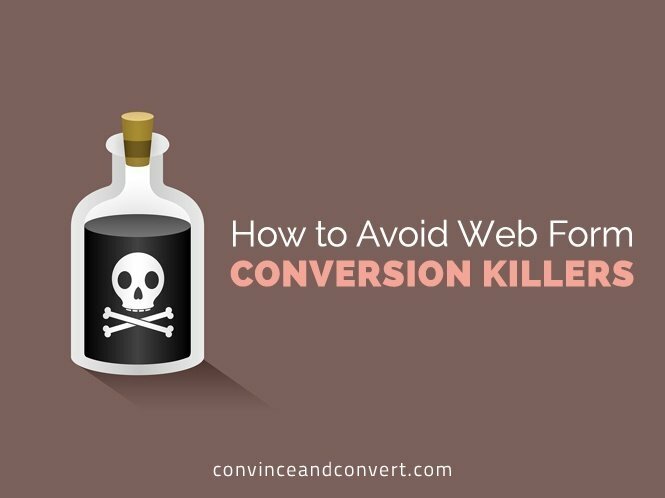 Interested in more great tips for combating conversion killers? Check out our latest infographic below, and join Formstack for a webinar on Thursday, July 23.